Can you believe that I had to try and make my bill area look messy for this post? Crazy. It usually looks much worse, but I had just recently tidied it up. I guess a more accurate title for this article would have been “5 Ways to Organize Your Mail” or your papers. 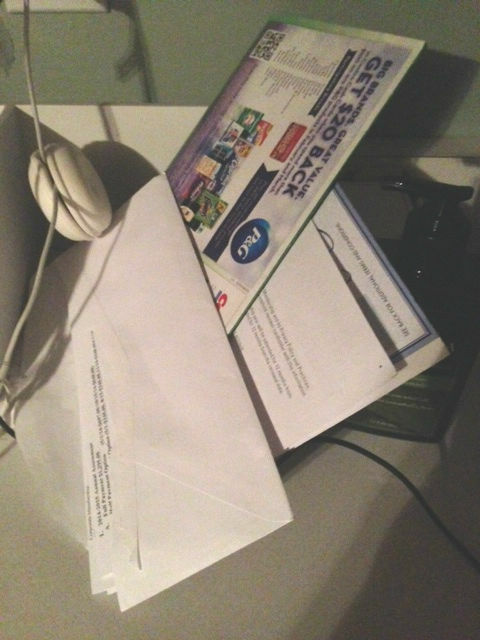 Anyway, here are my five tips for getting rid of mail clutter. 1. Have a place for it. In my kitchen, I have this little countertop area next to the fridge. I have that little wooden organizer thing there along with a notepad and pen. In the drawer underneath the counter I keep my checkbook, stamps, and a letter opener. This is where I open and process the mail. 2. Try to handle it once. I admit I’m not always good about that, but I try. In the pile that you see in the picture, there is our annual home owner’s information and bill, along with a check from Costco to go towards our membership. Since I didn’t plan on paying the POA bill right away or renew my Costco membership, they are still there. Here’s what I do with almost everything else: junk gets sorted immediately and goes in the recycling bin unless it has personal information on it. Then it gets shredded. Bills are noted in my planner with due date and amount in green ink. Color coding. 🙂 Then they are shredded. Invitations are noted in the calendar (red for family) and thrown into the recycling bin. Things we need to keep, such as my dad’s insurance papers, are filed in an expandable file folder that is just for his stuff. 3. Take action ASAP. This is kind of similar to the above hint. If we get an invitation with an RSVP, I respond right then or schedule it into my planner. Sometimes I need to talk to someone or check the calendar to see if we can go. 4. File the important stuff right away. I have a small file cabinet that stores our files. There are folders for each family member, each car, the dog (hey she has important papers too! ), and each room in the house as well as our retirement and investment stuff. The files for each room in the house work this way: if we buy a new appliance for the kitchen, the papers associated with it go in the kitchen folder. Papers for a new roof would go in a file called “Whole House”. 5. Do it daily. I know there is a strong tendency to toss the mail on the counter and get to it later. Except that happens a few days in a row and now you have a mess. You might even have missed something important. Do you know that I used to get letters – sometimes more than one – from our insurance company because they would send us a check of some sort and we wouldn’t cash it because we didn’t know about it? To be fair, they do generate and mail a lot of paper to their customers, but their checks don’t go unnoticed now. Locate an area for your mail, do it daily, and if you can, find some cute containers to hold your supplies. Might as well enjoy your view while you’re at it.